Meditation is a practice that involves the self-regulation of the body and mind to achieve mental, physical and spiritual well-being. The main mechanism of meditation is the training of attention and awareness to bring automatic mental and physical processes under voluntary control, thereby inducing a state of calmness, heightened alertness, and blissfulness. Recent research indicates that such experiences produced by meditation practices can be related to changes in default mode network (DMN) activity, where meditation appears to reduce activity in the main nodes related to generation of wandering thoughts, and increase connectivities of regions implicated in cognitive control and self-awareness. Neuroimaging studies also indicate a number of functional and structural changes related to meditation, such as thickening of cortical gray matter. These cortical changes seem to link meditation with a number of long-term effects on learning and plasticity, stress and depression, and pain perception. Furthermore, meditation has been shown to have positive effects for people diagnosed with epilepsy, possibly through inducing cortical thickening and changes in DMN connectivity. Meditation has been shown to have some clinical applications, and have been integrated into therapies such as Mindfulness-Based Cognitive Therapy (MBCT) and Mindfulness-Based Stress Reduction (MBSR). Through current scientific literature, it is clear that mediation is not just a spiritual practice, but also one that neuroscientists should take seriously in their understanding and research. 1. Jevning, R., Wallace, R. K., & Beidebach, M. (1992). The physiology of meditation: a review. A wakeful hypometabolic integrated response.Neuroscience & Biobehavioral Reviews, 16(3), 415-424. 2. Brewer, J. A., Worhunsky, P. D., Gray, J. R., Tang, Y. Y., Weber, J., & Kober, H. (2011). Meditation experience is associated with differences in default mode network activity and connectivity. Proceedings of the National Academy of Sciences, 108(50), 20254-20259. 3. Hölzel, B. K., Carmody, J., Vangel, M., Congleton, C., Yerramsetti, S. M., Gard, T., & Lazar, S. W. (2011). Mindfulness practice leads to increases in regional brain gray matter density. Psychiatry Research: Neuroimaging, 191(1), 36-43. 4. Laufs, H., Hamandi, K., Salek-Haddadi, A., Kleinschmidt, A. K., Duncan, J. S., & Lemieux, L. (2007). Temporal lobe interictal epileptic discharges affect cerebral activity in “default mode” brain regions. Human Brain Mapping,28(10), 1023-1032. Miller, J. (2008). 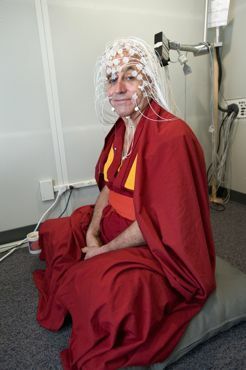 [Buddhist monk prepares for an EEG]. Meditation can refer to a broad variety of practices, which tend to share many similarities. Researchers tend to define meditation using common factors found among different schools of practices, thus meditation can be broadly defined as “a family of self-regulation practices that focus on training attention and awareness in order to bring mental processes under greater voluntary control and thereby foster general mental well-being and development and/or specific capacities such as calm, clarity, and concentration." While mindfulness practices and meditation are sometimes used interchangeably, some researchers make a distinction between mindfulness-based meditation and other types. For example, one definition of mindfulness-based meditation is the “non-reactive monitoring of the content of experience from moment to moment,” which is distinct from focused attention meditation, the “voluntary focusing of attention on a chosen object." Therefore, mindfulness is distinct from other meditation practices in that it focuses on passively monitoring one's own cognitive and emotional states as they are occurring, as opposed to actively suppressing or altering one's experiences to produce a certain state. 1. Walsh, R., & Shapiro, S. L. (2006). The meeting of meditative disciplines and Western psychology: a mutually enriching dialogue. American Psychologist,61(3), 227. The act of meditation has been practiced by our ancestors for centuries and only recently have scientists started to understand and explore its vast benefits. A specific topic sparking more interest is the understanding of how meditation influences learning and overall neuroplasticity. It has been shown that both short-term and long-term meditation practices have had beneficial effects on learning, through physiological brain alterations. Tested short-term practices include experiments where participants are gathered for a few months at meditation retreat and their ability to perform tasks prior and post-meditation had been monitored . Long-term meditators had also been observed, such as Tibetan Buddhists, whom demonstrate alterations in their brain physiology . Neurological structures involved in meditation, with specific correlation to learning include; increase in amount of grey matter in the brain, at the location of the hippocampus and an overall larger hippocampal and parahippocampal gyrus  which plays a significant role in memory, growth of white matter tracts, increase in gamma waves and activation of prefrontal cortex for example. Scientists have started integrating meditation as a more holistic approach to medical practices, such as for depression, pain perception and even addiction, but it is also able to elucidate the vast benefit into other areas of the human brain and allow for overall heightened learning and plasticity. Meditation is a Buddhist derived cognitive control practice in which an individual sustains attention nonjudgmentally on the current moment. It redirects attention away from thoughts of past or anticipatory experiences when they arise. 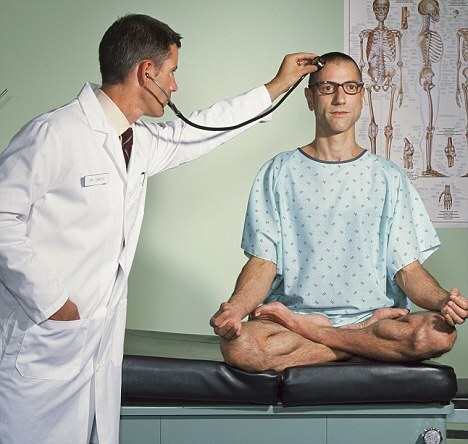 Meditation is being used for pain control. Many studies have shown that meditators experience a painful stimulus differently than non-meditators [e.g. 3-6]. Pain has a strong subjective component. It is for this reason that clinicians are studying the application of medication to pain management. Currently, research lacks a clear and universal understanding of the therapeutic mechanisms behind meditation as a modulator of pain . Meditation research could provide a better understanding of the subjective nature of pain perception and potentially provide the opportunity of improving non-pharmacological analgesic treatments. 2. Carlson, L. E. Mindfulness-Based Interventions for Physical Conditions: A Narrative Review Evaluating Levels of Evidence. ISRN Psychiatry (2012). 3. Gard, T. et al. Pain attenuation through mindfulness is associated with decreased cognitive control and increased sensory processing in the brain. Cereb Cortex 22, 2692-2702 (2012). 4. Grant, J. A., Courtemanche, J., Duerden, E.G., Duncan, G. H. & Rainville, R. Cortical thickness and pain sensitivity in zen meditators. Emotion 10, 43-53 (2010). 5. Grant, J.A. & Rainville, P. Pain Sensitivity and Analgesic Effects of Mindful States in Zen Meditators: A Cross-Sectional Study. Psychosomatic Medicine 71, 106-114 (2009). 6. Perlman, D. M., Salomons, T. V., Davidson, R. J. & Lutz, A. Differential effects on pain intensity and unpleasantness of two meditation practices. Emotion 10, 65-71 (2010). 7. Zeidan, F., et al. Brain Mechanisms Supporting the Modulation of Pain by Mindfulness Meditation. The journal of Neuroscience 31, 5540-5548 (2011). According to the World Health Organization more than 350 million people suffer from depression and 1 million people commit suicide each year. The research to find effective treatments for Major Depression Disorder (MDD) is incredibly relevant. Recent research shows meditation is comparably effective to antidepressants in relieving symptoms of MDD . In addition, Mindfulness-Based Cognitive Therapy is shown to be particularly effective in reducing relapse rates of depression  . Further studies suggests there are neurophysiological mechanisms that underlie the efficiency of meditation as a therapy for depression. For example, meditation has been shown to increase monoamines and decrease amygdala activity . It is evident and relevant that more research into meditation and depression should be encouraged in the neuroscience community. 1. Teasdale, J. D., Segal, Z. V., Williams, J. M. G., Ridgeway, V. A., Soulsby, & Lau, M. A. (2000). Prevention of relapse/recurrence in major depression by mindfulness-based cognitive therapy. Journal of consulting and clinical psychology, 68(4), 615. 3. Jindal, V., Gupta, S., & Das, R. (2013). Molecular Mechanisms of Meditation.Molecular neurobiology, 48(3), 808-811. 1. Bain, P., Blass, J., Jenkins, H., & Johnson, M. (2012). Epilepsy. Current Medical Literature, 28(3), 88-90. Hi! just wanted to let you know that your bibliography for the opening paragraph is not linked. Hey y'all, I thought your topic was incredibly interesting and I just wanted to give you some feedback about some information about some things that I found interesting about your topic. I noticed that one of you cited a paper by Richard Davidson. I just wanted to say that he has done some incredible ground breaking work in the area of brain and mediation. If possible/ if you are interested, you should look up the organization he started: "Center for Investigating Healthy Minds" at the Waisman Center. They do some incredibly interesting stuff there, such as teaching kids to reflect (meditate) on their emotional states in order to be able to learn to control them. He has also done studies to show the correlation between mediation and plasticity in changing your personality type on the premises of brain activity, it's pretty amazing. Just wanted to share that! Cheers! You topic was really well laid out- I like how it started explaining the idea of mediation, mindfulness and brain activity before exploring each topic. If you're interested there's actually a really great course offered at U of T on this topic, it's NEW332 Buddhism and Mindfulness. It explores the neuroscience of meditation quite a bit, enjoy! Excellent! This is fantastic! I am a residence don at university college and I constantly tell my students about the science behind meditation. If you guys don't mind, I would love to forward some of the papers you used to some of my more intellectually interested students! Hi guys! I really enjoyed reading your neurowikis! All the articles were very informative and I believe the topic you chose were all very interesting. I especially liked how you included the link to the TED talk video at the top of the page :) I watched it just now and I found it very interesting. All your neurowikis are very visually appealing too. This is my favorite neurowiki:) Very interesting. I think it`s really important more research to be done in this area now that there is so much media attention focused on mindfulness and meditation. Great job! This is a really interesting page that links contemporary neuroimaging and scientific, technological advances with an age-old practise. It's definitely eye-opening to see an age-old practise being evaluated with modern techniques. I've been interested in meditation and your wiki just gave me more insides into the topic. I have read some where about meditation can help with the recovery of cancer patients and I myself knew someone who has cancer and benefits from medication. It would be an interesting sub-topic. Great job! such an interesting read to justify the positive effects of meditation on the brain - you have convinced me to try out meditation.